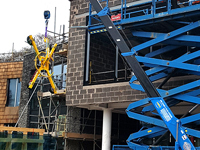 Hird Group has invested in a new fleet of 50 Genie powered access machines across a wide range of types to expand and strengthen its access hire service. 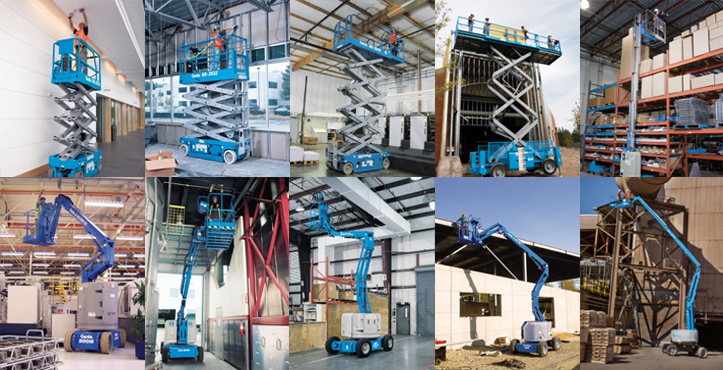 The Hull-based access, mini crane, glass lifting, and contract lifting specialist is taking delivery of 10 different models from the Genie powered access range, including scissor lifts, access booms, and personnel masts. 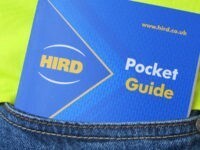 Hird Managing Director Phil Hird said: “Genie is the global market leader in powered access. Over the last 20 years, we have developed a fantastic working relationship with the Genie brand. “Buying primarily Genie powered access machines, while investing in other specialist access equipment to meet specific customer needs, has big benefits for our customers. It allows them to standardise operator training and gives them access to market-leading safety features and performance, including reliability. 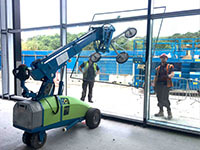 The machine has a maximum working height of 7.8m, an impressive lifting capacity of 227kg, and is narrow enough to pass through standard single doors. With front-wheel drive and zero inside turning radius, it delivers excellent manoeuvrability in tight spaces. A machine that delivers a stable, reliable and easy-to-operate lift which the flexibility of a built-in platform extension, and a maximum working height of 9.92m. Zero-emissions and low-noise operation makes this machine ideal for use in sound-sensitive indoor workplaces, such as offices and shopping centres. Though it can be used outdoors as well. 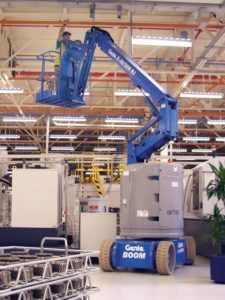 With a larger working platform, the Genie GS2646 has a maximum working height of 9.92m combined with a lifting capacity of 454kg. Yet it is still just 1.17m wide, so has excellent confined space performance. 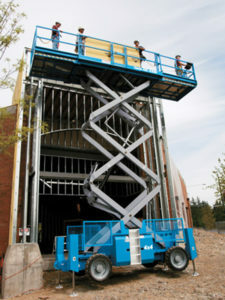 Like other Genie scissor lifts, it also has excellent safety features, including a tilt sensor with an audible alarm. 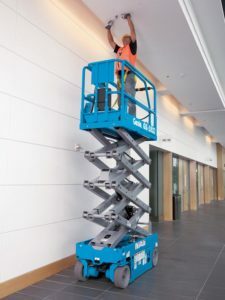 A rough terrain diesel-powered scissor lift with a lifting capacity of 1134kgs, and a maximum working height of 11.94m. It has four-wheel drive, plus positive traction control, gradeability of up to 50%, and proportional lift and drive, for safe and smooth operation. Personnel masts have become increasingly important for working at height, as contractors ban ladders on safety grounds, and now want greater productivity and flexibility than can be given by scaffold tower systems. 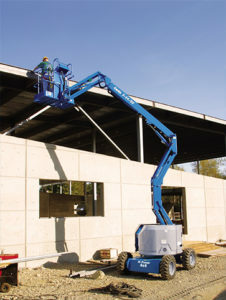 The highly compact GR20 has a maximum working height of 8.02m and can be driven when fully extended. It has zero inside turning radius and 30% gradeability. 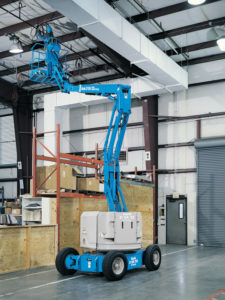 An articulating boom (cherry picker) that gives operators zero tail swing and zero front arm swing, in both stowed and raised working set-ups. This makes it ideal for use in narrow aisles, and other confined spaces. 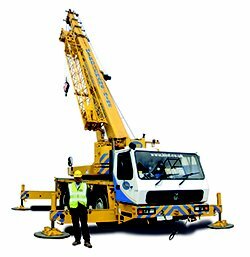 It has a maximum working height of 10.89m, and 180-degree powered platform rotation. 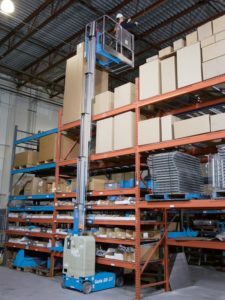 The machine’s dual parallelogram riser design means the platform can be lifted or dropped in a vertical plane without extending or retracting the boom. A cherry picker with a maximum working height of 12.52m, and zero tail swing. It can be rolled through standard double doorways. The self-levelling platform has 180-degree horizontal rotation for precise positioning. The machine has automatic hill and ramp braking. A boom lift (cherry picker) with a working height of 15.92m that is suitable for both indoor and outdoor operation. Due to multiple points of articulation, the Z45 range gives customers great versatility with excellent up and over outreach. Working in confined space is optimised with a turning radius of just 3.15m, and dual parallelogram risers. 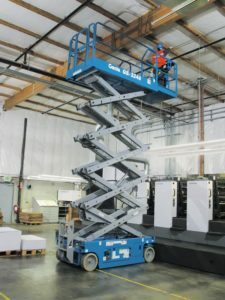 A diesel-powered rough-terrain cherry picker that gives operators excellent productivity for outdoor use. It’s robust and stable design makes it perfect for construction and industrial applications. 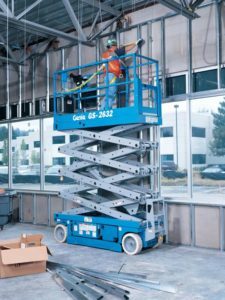 The Z45/25RTJ has a maximum working height of 15.94m and, like other Genie boom lifts, can be driven from the platform in its extended position. 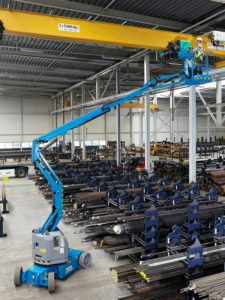 An articulating boom with a maximum working height of 20.87m. Like the other Genie access booms Hird has purchased, The Z62/40 also has excellent horizontal reach, in this case 12.47m. A 1.52m jib has 135-degree rotation for accurate basket positioning. 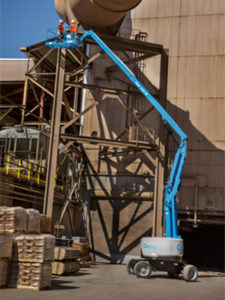 The Genie Fast Mast ™ boom system allows operators to descend and retrieve materials and quickly return to working height, while 4-wheel drive and full-time active oscillating axles provide traction for gradeability up to 45%. 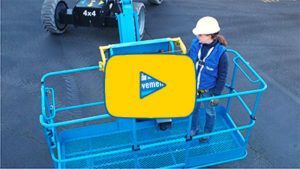 All the new booms detailed above are fitted with Genie’s new Lift Guard™ contact alarm. It interrupts boom movement when the operator makes sudden contact with the platform control panel, and alerts ground personnel with audible and visible alarms. The new powered access machines can be hired nationally via Hird’s three regional operational centres. IPAF-accredited operator training is also available. 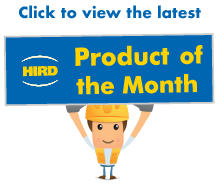 For more information about powered access, as well as mini cranes, spider cranes, and glass lifting equipment hire, call Hird today.